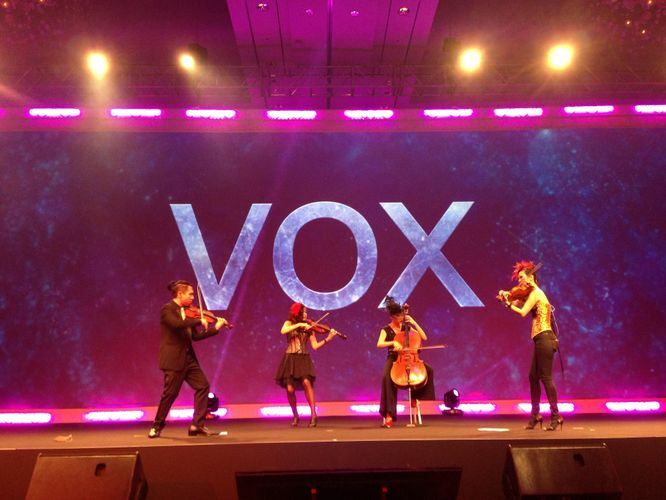 Singapore’s first pop/rock band on strings, VOX comprises four members who strum up a new sound with the acoustic violin, viola and cello. Conceptualized 4 years ago by 4 classically-trained musicians, VOX was formed to turn classical music on its head by reinterpreting pop/rock with classical instruments. With their bold re-interpretations of rock classics, such as Sweet Child Of Mine and Paint It Black, as well as more recent hits by Adele, Muse and Kings of Leon, VOX has upstaged the stereotype that classical and pop/rock genres do not co-exist. Their signature sound, fueled by adrenaline, energy and raw emotion, has turned heads at major happenings in Singapore, including F1 (2010-2012) and the 2011 Youth Olympic Games.